SQL Azure is Microsoft’s cloud database service. Based on SQL Server database technology and built on Microsoft’s Windows Azure cloud computing platform, SQL Azure enables organizations to store relational data in the cloud and quickly scale the size of their databases up or down as business needs change. Data is hosted, managed and provisioned in Microsoft data centers. SQL Azure is a relational database-as-a-service, fully managed by Microsoft. For cloud-designed apps when near-zero administration and enterprise-grade capabilities are key. Perfect for cloud architects and developers looking for programmatic DBA-like functionality. 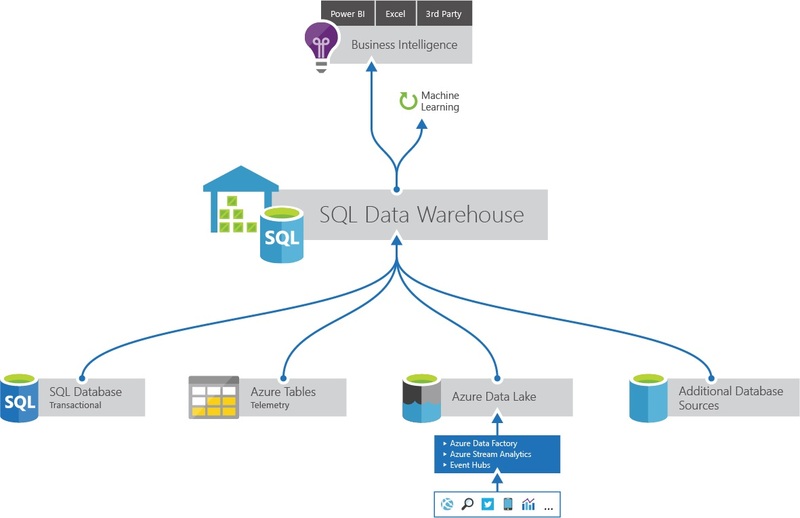 Azure SQL Data Warehouse is a cloud-based, scale-out database capable of processing massive volumes of data, both relational and non-relational. Built on our massively parallel processing (MPP) architecture, SQL Data Warehouse can handle your enterprise workload. Combines the SQL Server relational database with Azure cloud scale-out capabilities. You can increase, decrease, pause, or resume compute in minutes to seconds. You save costs by scaling out CPU when you need it, and cutting back usage during non-peak times. Leverages the Azure platform. It’s easy to deploy, seamlessly maintained, and fully fault tolerant because of automatic back-ups. Complements the SQL Server ecosystem. You can develop with familiar SQL Server Transact-SQL (T-SQL) and tools.